Provide comfort for the family of Pastor Samuel Pittman with a meaningful gesture of sympathy. 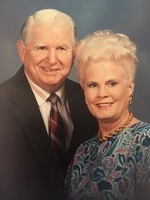 Long time Southern Baptist pastor and denominational executive Samuel (Sam) McDaniel Pittman, age 90, went home to be with his Lord, February 16, 2019 in Highland Village, Texas following a lengthy illness. He is survived by his daughter, Dr. Cheryl A. Tucker, and son-in-law, Dr. Michael G. Tucker, and two grandsons, David W. Tucker, his wife Kimberly, and Michael M. Tucker, all of Texas; a son, Vance Mayhugh Pittman of Florida; two granddaughters, Constance and her husband, Ryan Blackwell, and Crystal and her husband, Nigel Sidial, and two great grandchildren, Christopher Taylor and Nigel Sidial all of Virginia; and a sister, Betty Reid, of South Carolina. Sam was a native of Greenville, South Carolina and raised in the shadow of Paris Mountain. He was the son of the late Alvin and Rosalee Pittman of South Carolina. Sam was an alumnus of Furman University where he played football on a scholarship. He earned two degrees (B.D. and Th.M.) at The Southern Baptist Theological Seminary in Louisville, Kentucky. He served twenty years as a pastor and director of missions in South Carolina, including pastorates at Six Mile Baptist Church and Mountain View Baptist Church in Six Mile; Homeland Park Baptist Church in Anderson; and as the founding pastor of Lee Road Baptist Church in Taylors. He led the Beaverdam Baptist Association in Seneca as Director of Missions, the first to serve in that role.. His passion for missions was demonstrated early in his ministry through his many short-term mission trips to Africa, Asia, and South America. In 1973 he joined the staff of the Southern Baptist Foreign Mission Board in Richmond, Virginia, which is now the International Mission Board (IMB). He worked out of the Office of the President serving with Dr. Baker James Cauthen, Dr. Keith Parks, and Dr. Jerry Rankin. His responsibilities included denominational relations, communications, and promotion of the Lottie Moon Christmas Offering. Sam never met a stranger and many called him the unofficial “chaplain of the breakroom” as he was always willing to listen. He retired from the IMB in 1996 and served as an interim pastor in several Virginia churches. His last interim was at Smithland Baptist Church in Heathsville, Virginia. He is buried in the Smithland Baptist Church Cemetery next to the love of his life, Katherine “Ann” Mayhugh Pittman, his wife of 49 years. Family and friends are invited to celebrate Sam’s life on March 23, 2019 at 11:00 a.m. in the chapel at First Baptist Church, Richmond, Virginia. Dr. Michael G. Tucker will preside. In lieu of flowers, the family of Sam Pittman welcomes gifts to the Lottie Moon Christmas Offering of the International Mission Board online at https://give.imb.org/ or via check payable to IMB and mailed to the International Mission Board, Attention: Ministry Advancement, 3806 Monument Avenue Richmond, Virginia 23230. Please name Sam Pittman in the gift so the family is notified of your expression of sympathy and love. To send flowers in memory of Pastor Samuel McDaniel Pittman, please visit our Heartfelt Sympathies Store. We encourage you to share your most beloved memories of Pastor Samuel here, so that the family and other loved ones can always see it. You can upload cherished photographs, or share your favorite stories, and can even comment on those shared by others. Provide comfort for the family of Pastor Samuel McDaniel Pittman by sending flowers. My family was quite fond of Sam. He was our pastor at Mountain View where my brothers and I developed a global-view of sharing the gospel. Mom served as Sam's secretary when he became Director of Missions for Beaverdam Association of churches. After Mom's death in February of 2016, we called Sam in Texas to let him know. Of course he had us all smiling and laughing before the call was over. Sam's smile and warmth are memories that will never leave us. We pray for your comfort during this time of loss. Bert, Bob and Betty Bowers Thompson, Salem, Powdersville, and Fountain Inn, SC. he was the pastor of mountain view church in six mile south carolina when we started coming to the church!to cheryl and vance,sorry to hear about it.